A short history lesson, please. 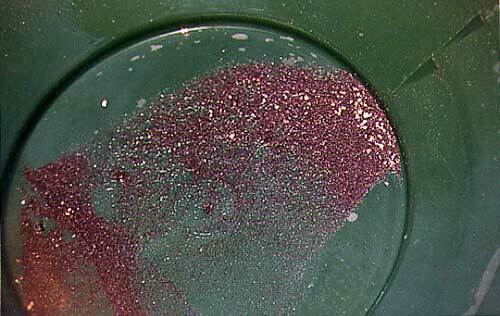 A million years ago, rocks melted, the earth cracked, and gold nuggets formed. End of class. A million years later, the nuggets are hard to find, but weekend prospectors search the desert wadis (washes), hoping to get lucky. "Gold is not going to go too far from its source unless there’s been lots of time and lots of water to wash it downhill," says David Steimle, a chapter president of the Gold Prospectors Association of America (GPAA). 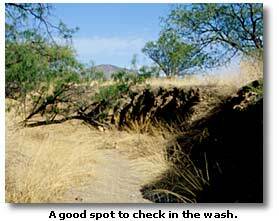 Standing recently in a wadi at the foot of Arizona’s Santa Rita Mountains, he said, "Flood waters thousands of years ago washed nuggets down the mountain through these arroyos and deposited the gold flakes we’re looking for today. Prospectors who have worked these gullies know they don’t produce a lot of sizable chunks, but they do give up a bunch of fine gold dust." Steimle walks Arizona’s wadis, poking and prodding the dry creek beds as well as mountain arroyos and mineral-rich sand, looking for gold still hiding in placer beds. "Placer deposits occasionally run for miles along a stream," he says. "Some spots get scratched and discovered, others are still undetected after all these years." In fact, a large percentage of the world’s gold deposits are still undiscovered despite man’s efforts to locate pockets of the precious metal. "Streams and their tributaries that flow across gold-bearing areas are likely to carry traces of the precious metal," says Diane Bane of the Arizona Department of Mines and Mineral Resources. "Where gold has been found in the past is the best place to seek it today." Gold was first reported about one hundred and twenty five years ago, near where Steimle stood, in what proved to be the largest and richest placer deposit in the southeastern corner of the state. 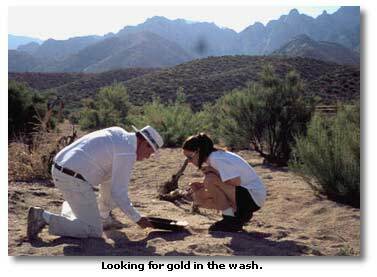 In fact, Arizona’s placer mining industry had its official beginning with the discovery of gold along the flanks of the nearby Quijotoa Mountains. From 1875 to 1880, several hundred miners and their companion burros worked an area from the nine thousand four hundred foot Old Baldy Peak to lower elevation claims. Their efforts produced about fifteen thousand dollars in gold each year. The hardest working miners each took out about one ounce of gold per day. At that time it was valued at seventeen dollars. Once the richer gravels had been worked over, commercial mining ended. But weekend prospectors began to appear, seeking what their earlier counterparts might have missed. 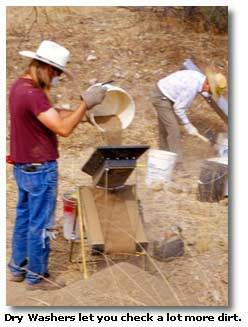 Placer gold is still found in almost all southwestern deserts, according to former Bureau of Mines engineer George Fansett. "Moving water has been the most potent factor in the formation of placer deposits," he says. "The usual practice is to seek gold by panning along the water coursesstream beds, sand bars, gulches and arroyos. All areas that look as though a slowing down or slackening of water current occurred are worthy of closer examination since gold, being heavier than most materials, tends to settle and sink to bedrock. Depressions may hold rich pockets of gold while bedrock that is fissured and shattered, acting as riffles, also holds good potential," he says. The potential as well as the dreams, success and frustration is reflected in the names of some mining claims: "Great Hope," "Maybe, Maybe Not," "Wishful Thinking," "One More Time," "Easy To Get," "Try Your Luck," "Blood Blister" and "Big Bruiser." "Many men have attempted to make a living reworking old placer ground," says Fansett. "If the ground has not been worked over many times and the bottom of the wash not carefully searched, a painstaking cleaning of crevices and potholes may yield lucrative results." Lucrative is an ill-defined word here. 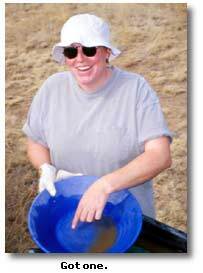 GPAA member Judy Miller has searched for gold in these stream beds using both dry- and wet-wash methods. "I’ve been doing this for about four years," she says. "I’ve had success, but based on what I take home after each trip, I’m not yet ready to retire." Further downstream from where Miller digs, sifts and pans, fellow club member Mike Rebholz chews on an unlit cigar as he swishes water in his green plastic pan. "I’ll tell you what," he says with a grin, "it’s not the Mother Lode, but for this spot, it ain’t bad. There’s color in the pan, and if we could do that every pan full, by the end of the day it would be worthwhile. We’d have a pile big enough to see without a magnifying glass. It’s fun though, that’s the main thing." Fun and a few flakes are what it’s all about to most participants. "A lot of us take a pick and a pan along on every outdoor jaunt," says Steimle. "I have no get-rich-quick fantasies. There are days when some flakes show up and others when the pan keeps coming up empty. It’s the chase that’s most exciting, knowing the next shovel load or upturned rock could produce flakes or even a small nugget. Not that finding something doesn’t make your heart beat faster, but I enjoy the hunt as much as I enjoy any discovery.."
"You’re not going to get rich mining gold," says New Mexico geologist Dave Salars. He uses gold panning as an excuse to be outdoors, "kind of like going fishing without baiting your hook," and he’s not too concerned about bringing home gold dust as long as the activity itself offers fresh air and sunshine. "I make more money some weekends at swap meets, buying bargains and re-selling the stuff," he says, chuckling, "but I do enjoy the exercise, camaraderie and the search for buried treasure." He’s found some, too, in the Pinos Altos Mountains of New Mexico. "I found a chunk of pyrite material with a rice-sized piece of gold inside. It made my heart beat faster, and I got the gold bug really bad," he remembers. That was seven years  and a lot of unsuccessful trips  ago. Salars, now club president of the two hundred and fifty-member Desert Gold Diggers, Inc., is quick to caution, "You don’t do this to get rich. You learn real fast why gold is worth so much, because it’s hard to find and hard work to recover. You’ve got to examine a lot of sand before you’re successful." Weekend gold seekers need to understand that experience is the best teacher, and it takes practice in the field to gather that experience. "Some folks go out and buy a bunch of equipment like metal detectors, thinking ‘I’m going to get rich this weekend,’" Salars says. "Two years later, they’ve used the equipment twice and it’s for salesort of like the exercise machines bought with good intentions that end up as expensive clothes hangers." Just as there is no complete and correct equipment list, there is no right way to conduct a hands-on search for the shiny metal. If you’re lucky enough to live in an area where the elements provide standing or slowly moving shallow water, you’ve just eliminated the need to bring your own. If not, the option is to carry water to the dig site, keeping in mind that one gallon weighs eight pounds, and some of the liquid needs to be saved for drinking. To pan for gold, gather a handful of gravel and put it in your pan (preferably a green, red or blue pan to reflect the glint of any elusive gold flakes). Pick out the larger pieces of rock and dirt. Pour water into the pan, swishing it around to separate gravel from dirt. Tilt the pan slightly (ten-degree angle, riffle end down), allowing heavier materials to settle in the bottom. Eyeball the action constantly looking for black sand, red silicate garnets or gold. When the elusive gold flash-in-the-pan does appear (notice the optimistic "when," not "if"), use your sucker bottle or tweezers to remove the flake or nugget. While "painfully rare" describes the chances of a lucrative "strike" occurring on a weekend outing, "medium rare" often describes the sunburn new prospectors may acquire. "Wear a wide-brimmed hat, apply plenty of sunscreen and drink lots of water," says Salars. "Keep an eye out for critterstwo-legged, four-legged and eight-legged. Tell someone where you plan to be and when you expect to return. And bring a friend. The buddy system isn’t just for swimming." Enjoy the event and keep expectations to a minimum. "There is no reward greater than that of fresh air and exercise and, if nothing else, amateur prospectors are sure to find plenty of both."